I am following one of your training plans in preparation for the 2016 Boston Marathon. This will be my third Boston and my ninth marathon. I followed your Boston Bound training plan for my first Boston, and I wondered why the taper was only two weeks long. I do not remember ever doing a 20-mile run so close to race day. I have read that the last long run should be four weeks before the marathon. During those last four weeks, supposedly it is better to do quality training, such as speed work and tempo runs and limit longs runs to no longer than 10 miles. What is the thinking behind such a short taper? Only in Boston Bound, which is 12 weeks and one day long, do I suggest a two-week taper. Most of my 18-week marathon training programs offer a three-week taper after the final long run in Week 15 of 20 miles. In my mind, four weeks stretches the taper almost too long, but I know different coaches have different approaches. As for including speed runs in the taper, if you have been speed training through the long build-up, certainly continue, but I would not initiate any new-style workouts in those last two or three or four key weeks. Boston Bound is different because it is aimed only at those talented and well-trained enough to qualify for the Boston Marathon, also known as getting a BQ. All others (including those who obtained an entry by running for a charity) should not apply. They would meet with more success following one of my standard programs. Another reason for the shortened taper is calendar-related. The time period is limited between the Holidays in December/January and the Boston Marathon in April, not long enough to squeeze in a full 18-week program. Runners would need to start serious training before Christmas. When I designed Boston Bound several years ago, it seemed logical that many runners would like to be free to enjoy the holidays and not start goal-related training until after the New Year. 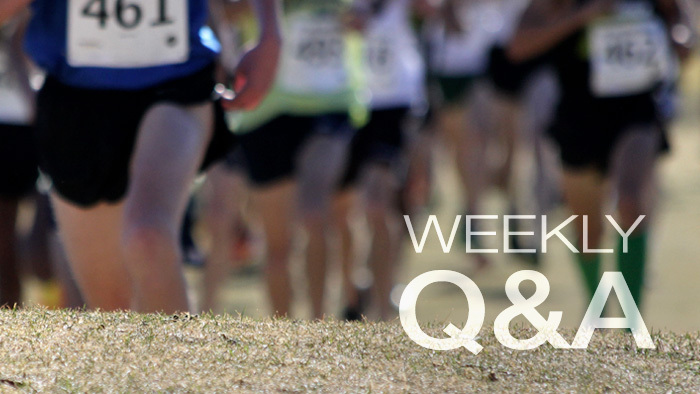 As users of the plan know, Week 1 features a 13-miler, which assumes a high level of fitness. From a motivational standpoint, the timing seemed good when I was creating Boston Bound. But another reason is that a two-week taper allows everybody to squeeze in an extra hard week of training in early April with the winter winds behind them, when the weather is just starting to get good. Other coaches may feel differently. If you believe you need more taper time and/or more speed runs, you are certainly free to take that route.